The Sad Side Of Ranching - Seller Lied About Vaccinations? The Sad Side Of Ranching – Dishonest Sellers? Tough days. I love raising bottle babies each spring but my health prevented it this year. So RancherMan found someone selling a set of bottle babies. They had already been weaned to pasture so that I could still get a dose of that bottle-baby sweetness. When they were purchased this spring they were brought to our ranch. That not only to allow me to scratch their necks every day but also for us to monitor them to make sure they would all do well in our program. As they grew larger we began moving them to our offsite pasture to finish growing. But several weeks after some of them had been moved, suddenly one of them died. I realize it’s a sad fact of ranching that sometimes you lose an animal to an injury, illness, or the many number of things that can go wrong even with a diligent caregiver. But it was so odd, he never showed any sign of illness. He was fine one day trotting to the trough for range cubes and a scratch behind his ears and then gone the next. RancherMan and I check the animals on that offsite pasture several times a week but in our Texas heat he had died several hours earlier & was already too far gone when we found him for us to determine for sure what happened to him. But then a couple of weeks later the same thing happened to another of our sweet boys, fine one day and gone the next. But this time we found him very soon after he died. After losing two in such a short amount of time we immediately called the vet out to find out what was going on. The vet met us in the pasture and performed a necropsy on the calf. He determined that the probable cause due to the indications he saw was… BLACKLEG!!?? The vet explained to us that the spore for blackleg is common in the soil and it lays dormant for quite a while. But when the animals come into closer contact with the soil such as during a drought when they’re nibbling closer & closer to the ground, the organism can be contracted, yet even then will often lay dormant in the animal. But sometimes for unknown reasons it activates, gets into the bloodstream and is quickly lethal. Of course we already knew that. It’s why blackleg is a mandatory vaccination (among others) for all of our animals as part of our herd health program. Properly protected the chances are minimal that the animal will contract this illness. Seller Lied About Blackleg Vaccinations? But here’s the curious part – how can it be that this calf died from blackleg when the person we bought him from told us all the bottle calves were already vaccinated – even gave us the product name & vaccination date! I can’t imagine why she’d tell us such a thing if it weren’t true. But to lose two animals so quickly in the same way, this would have to be a super-colossal coincidence to be anything other than blackleg contracted by two unprotected animals. Sadly folks this is both an emotionally and financially painful lesson learned: from now on we’ll not take a seller’s word that proper protection has been given, we’ll take matters into our own hands & do our own vaccinations even if we’re told by the seller that they’re up to date. But now what about our other bottle calves? Although blackleg is not contagious all our sweet babies were loaded up immediately from our offsite pasture and brought home to receive that important vaccination that’s a mandatory protection in our herd. Although we had to vaccinate those remaining calves by headlight we didn’t want to wait one more day! At least now they’re finally protected as they should have been all along. Let’s hope we caught it in time so no others will be lost. 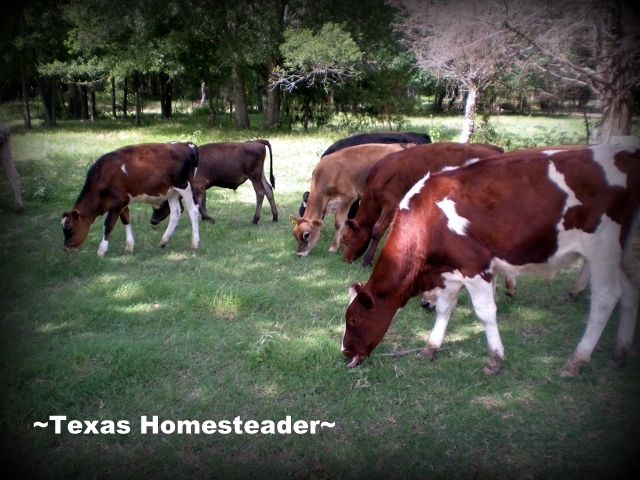 This entry was posted in Blog Posts and tagged Calves, Ranch Life, Stocker Cows on October 15, 2013 by Texas Homesteader. I am sorry you lost two calves. We have a family ranch where we raise Gelbvieh cattle for breeding stock (my Mom & brother). You are right, it is not easy to loose any of your cattle to an unexpected death and it is very sad. Even though they aren’t pets you still value each and every one of them and for us, anyway, our cows are on the farm until they are very old and you get to know their personalities and you get attached to them. We had several losses due to the extreme rains. I think non-farm folks think that losing animals is somehow easier for the farmer–or they get used to it or something. I know I certainly haven’t. It brings me to tears every time. You learn to accept it, but it still hurts. Especially when it’s sickness and you’re in there for hours or days fighting to save them! But I try to focus on all the miracles we get to see too. My favorite ram got his head stuck in a gate when he was 5 yrs old and twisted until his big double curl horn broke. We had to saw it the rest of the way off his head. The vet was sure he wouldn’t make it due to the high risk of infection at the open head cavity. They gave him 3 days. We nursed him in the garage lean-to for 30 days–cleaning and changing bandages twice a day and he pulled through–although he always looked a little lopsided. 🙂 He’s still doing “his job” on another farm 6 years later. Even our vet still tells the story. We had almost the same problem with the bottle calves we got this year. 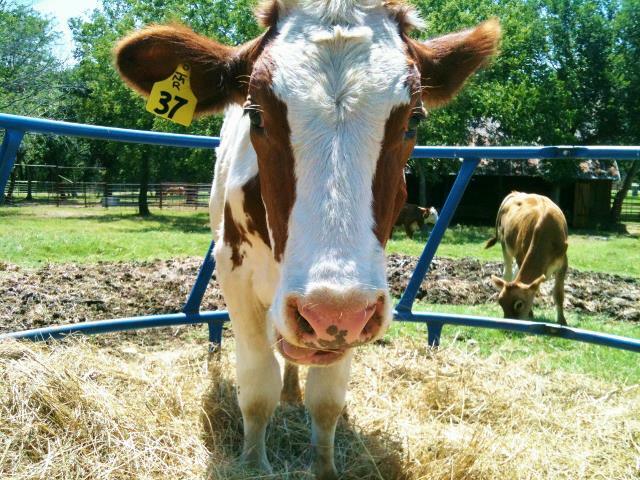 We recently purchased our farm ( December 2012) and purchased 7 bottle calves. We were told that they had nursed for a couple of days but then were taken from mom and had been on the bottle for two or more days, depending on the calf. We lost one the first night. The second one a week later. At this time we called the vet out and he gave them all medicine. The third one we lost 2 days later. The fourth the following day. The vet came out again. The fifth one held on for ten days more before we lost him. The sixth and seventh are still with us and are healthy bulls. But what a sad lesson it was! The vet said that they must have been taken from mom immediately after birth and did not get the much needed colostrum from her. They all had pneumonia when they died. Now we only buy from people we know or who are referred to us. I am so sorry to hear of the loss of your cows. It is unsettling to have something like this happen and not know why. I am glad you discovered the cause. My daughter has recently moved to a small farm and has found that there can very as much sorrow as joy when it comes to having animals. I think you would understand that. I feel so bad for you guys. It has been a long time since I left the farm and it would be tough to go back to learning to accept the death of farm animals. As a beef rancher or chicken farmer or raising pigs or rabbits as far as that goes….I’d probably become a vegetarian because I would surely make pets out of each and every one. I’d make a lot of profit, right? If the time comes where I seriously have to become self sufficient to survive, I would have do some major rehabbing to my brain. I follow a lot of you guys on your blogs and am so impressed with how you deal with these hardships. I also find a new respect for my parents and their struggles. Strong people. God’s people for sure. My oh my, I have never heard of such a thing. But, then, I’m not a cattle rancher. I’m sorry this happened to you – it kind of makes you not want to trust anyone anymore! I know this isn’t much solace, but I pray that next year’s bottle babies will be healthy and happy!